We asked our new Associate, financial crime expert Vesna McCreery to tell us her key predictions for fighting financial crime in 2019. Financial Crime in banking is usually synonymous with regulatory measures to combat money-laundering, corruption and ensuring compliance with financial sanctions. However, we should also consider cybercrime under this umbrella, even though it has not traditionally been the responsibility of the Money Laundering Reporting Officer. Unfortunately, I believe we are going to see continued and more sophisticated attacks on online users of financial products, particularly those who use mobile services. Some financial firms are trying to keep up with this, and some are doing so with a degree of success but it is unlikely that these sort of attacks are going to be easy to resolve or become less risky. Social engineering, which feeds authorised push payment fraud and other payment scams, is likely to continue contributing to rising losses and suspicious activity reporting numbers. The final and most obvious aspect of cybercrime to consider is continued data breaches and hacking successes that help obtain information from a variety of sources. Even if the source is not necessarily a bank, hacking does still expose financial institutions by revealing banking details of their customers. The likely regulatory response is additional pressure from regulators to tighten protections for customers, force improved prevention around fraud and money laundering through automation and increased use of data analytics. 2019 is likely to see the continuation of cooperation between investigative authorities and financial services firms, and this is set to widen and grow over time even if the pace feels glacial at times. While this is a positive, we have also seen the regulators use this data exchange against large banks with criminal investigations being launched following what should have been perceived as exchanges in the spirit of trust and co-operation. It will be interesting to see if this stifles the industry / regulator dialogue in the future. But the practice is spreading globally and ultimately, authorities should be aiming to use the financial institutions as valued data sources more productively, rather than having endless attempts to criminalise their possession of such data. Striking the right balance on that account could be an interesting area to observe. There is no question that data protection affects how financial crime relevant information is gathered, stored and deleted – now more than ever. Some interesting tests of this might come in 2019. And this is clearly related also to how firms are able to process and analyse information they have on customers in different silos and pockets, and that may at any given time look unrelated but with hindsight look “obviously” related to an issue uncovered externally by authorities or journalists. One of the key trends in 2019 will be the continued exploration of new and known technologies – also known as regulatory technology – to help manage the pressures created by new forms of crime and continually higher regulatory expectations. Financial institutions need innovation to compete and to protect themselves from crime, but finding a way of identifying firms products that resolve these problems rather than just having a good sales pitch can be problematic without participating in extensive testing. For small RegTech firms, this can mean delayed revenue whilst having high monthly burn-rates, which can threaten their financial survival. It will be fascinating to see how this problem is resolved in practice and if simple referral by one institution to another will continue to be good enough or if services of those who can test and advise on behalf of the financial institutions will be used more widely. Our recently updated RegTech directory is a key resource for informing buyers about the RegTech products than can help them fight financial crime. 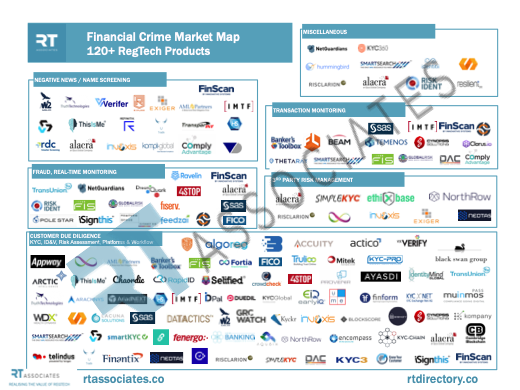 The Financial Crime Market Map analyses 120 products from RegTech firms to match them to specific financial crime use cases. If you would like more information about this aspect of the RegTech market, do get in touch. Previous Post …what it is and what it is not.